Restarting death streak after quiet month, terrorist killed and 5 others wounded in Gaza terror tunnel collapse, raising total to 12 killed. A Hamas terrorist was killed on Thursday and five other terrorists were wounded when a tunnel collapsed in Khan Yunis, located in southern Gaza. The Hamas health ministry identified the killed terrorist as 31-year-old Mohammed Mussa al-Astal. The death restarts the series of tunnel fatalities in Gaza after a break of nearly a month. Early last month the tally reached as high as 11 Gazans who died while digging tunnels, in collapses that came in quick succession. Except for one civilian working on a smuggling tunnel into Egypt, all of those who died were Hamas terrorists. Aside from Hamas, the Democratic Front for the Liberation of Palestine (DFLP) Communist terror group has also recently bragged that it is building tunnels, in preparation for the next war against Israel. 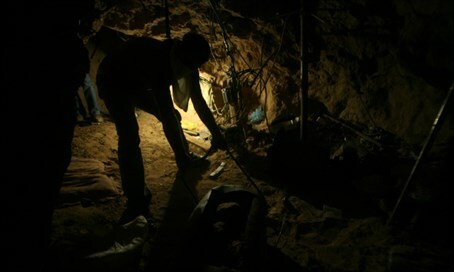 The IDF has warned that Hamas is focusing its tunnel digging efforts on one central terror tunnel, where over 1,000 terrorists are working to dig far under the security barrier so as to enable an attack deep in Israeli territory. Israelis living in the surrounding environs of Gaza have reported hearing the sound of digging from beneath their homes, with vibrations even shaking their houses. Last month, State Comptroller Yosef Shapira sent Prime Minister Binyamin Netanyahu and Defense Minister Moshe Ya’alon (Likud) a draft of his report on Israel’s handling of the tunnel threat, which details serious defects in the government's handling of the terror tunnel issue. In a response to the threat, Ya'alon late last month acknowledged that Hamas is building tunnels and said Israel is preparing for the next war from Gaza.